Subsidized videophones are popular, but some say that costs are too high. Larry Taub makes a phone call on a videophone, which allows users to communicate with a relay center through sign language.
. The phones are now a reality - for more than 100,000 deaf people. The futuristic phones exploded in popularity when the Federal Communications Commission began, in late 2000, to reimburse companies for staffing call centers with sign-language interpreters. The deaf beam themselves into the hearing world by calling the government-subsidized sign interpreters on a videophone. The sign interpreters then place a call and repeat, or relay, the deaf person's conversation to a hearing person. The service is undoubtedly a benefit to deaf individuals. But supercharged growth and business practices in the new industry have raised serious concerns about the price tag for the public. The market for video, Internet and other relay services for the deaf could soon top $1 billion a year, up from less than $50 million in the late 1990s. 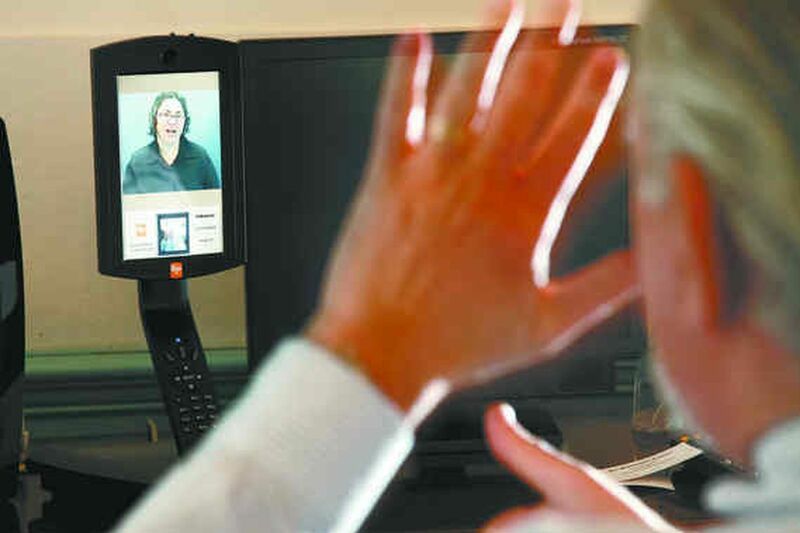 Sorenson Communications Inc., of Salt Lake City, which calls itself "the phone company for the deaf," is the dominant provider as both a videophone manufacturer and a provider of sign interpreters at video-relay call centers. Thomas Chandler, the chief of the FCC disability-rights office, said in 2007 internal e-mails that the video-relay program was a "classic fleecing of America." The government, he said, was reimbursing companies for it at "ridiculously high rates." A congressional committee agreed in a December 2008 report that concluded consumers were overpaying. Relay services for the deaf are paid through a surcharge on everyone's long-distance phone bills. The FCC also has heard complaints that video-relay companies offer sweepstakes games and other incentives to a captive market of deaf users to inflate videophone usage, and thus reimbursements from an FCC-controlled fund. For many years, business compliance with the Americans With Disabilities Act of 1990 was viewed as a marginal cost of doing business. Big phone companies provided a teletype service at cost and earned an 11.25 percent return on investment in equipment. This decade, though, the FCC tried something new. It backed the brand-new video-relay industry and agreed to finance start-up business expenses, marketing, outreach training and executive compensation. The expenses were built into per-minute rates for video display. With this opportunity, companies rushed to enter deaf-related telecom services, the largest being video. The FCC has authorized about a dozen companies for video relay. All a deaf person needs to get the free service is a broadband or DSL connection and a videophone, which sometimes is provided free by a video-relay company. A phone number obtained from an authorized video-relay company, such as Sorenson, GoAmerica Inc., Snap Telecommunications Inc., or CSDVRS L.L.C., connects the deaf person to a center with sign-language interpreters. There are about 150 centers in the United States. Neither the deaf person nor the hearing person pays for the per-minute usage. The usage minutes are charged directly to the Telecommunications Relay Services fund, which is controlled by the FCC. The fund itself is backed by a surcharge of 7 to 20 cents a month on consumer long-distance bills. Chandler, the FCC official, praised video relay in a brief conversation and said he did not consider himself a whistle-blower. He wrote his e-mails in 2007 as the FCC was considering new rates. The e-mails were contained in the December congressional report on the FCC and its Republican chairman, Kevin Martin. Democrats signed the report, and some say it was politically motivated. Sorenson Communications, which has distributed about 100,000 free videophones to the deaf, portrays Chandler's comments as one man's opinion. "They were conclusions that were not based on facts," said Michael Maddix, regulatory affairs manager for Sorenson. The FCC has encouraged innovation and competition in videophones for the deaf, Maddix said. Before Sorenson, the videophones produced "grainy images," he said. The company invested heavily in developing the videophones and is proud of what it has done to improve the lives of the deaf, Maddix said. Sorenson employs 5,000, about half of them sign interpreters. It has 90 call centers, one of them in Philadelphia. FCC documents state that Sorenson earned profits of $94 million in 2006, for a margin of 39 percent. Sorenson earned profits of nearly $60 million in 2005. About $40 million of the 2005 profit was paid in stock options to employees, according to FCC officials who had access to business records. That same year, Sorenson was sold to a Chicago private-equity firm. Terms were not disclosed. Maddix would not comment on the financial figures. Over Chandler's objections, the FCC approved new video-relay rates in November 2007. The tiered structure limits Sorenson's profit. The FCC has not disclosed publicly what it considers the proper level of profitability. The new per-minute rates are $6.77, $6.50 and $6.30 and are linked to the volume of calls to a company's video-relay centers. An FCC document stated that Sorenson's actual cost in 2007 was $4.06 a minute. FCC spokesman Robert Kenny said five FCC commissioners approved the new rates in 2007. The issue came down to what to include in rates as reasonable costs. The FCC was faced with eliminating the program or "keeping it intact and deciding what to pay for," Kenny said. On West School House Lane in Germantown, Larry Taub heads the Pennsylvania School for the Deaf. Taub has both a sleek Ojo videophone and a Sorenson videophone on his desk. Ojo is manufactured and marketed by Worldgate Communications Inc., a Bensalem company. Snap Telecommunications, of Pearl River, N.Y., provides the video-relay service for the Ojo. Taub, who spoke through a sign-language interpreter, prefers the Ojo because of its voice mail, or video clips. The Ojo contains the camera and display screen in one unit. The Sorenson equipment is a television monitor with a camera mounted on top. One Sorenson feature allows Taub to maneuver the camera's perspective with a remote. Taub recently invited Tony Crosta and Michael Finneran from CSDVRS, of Clearwater, Fla., to campus to learn about their phones. Taub said he liked the new competitive marketplace for videophones. Videophones and video relay have been a "meaningful breakthrough" for the deaf, he said. The school, which enrolls 280 from preschool through high school, has about 40 phones on campus. There is a public videophone in a room off the gymnasium where schoolchildren call home. That way, Taub said, if a basketball game goes into overtime, a player can call home and his parents don't have to wonder what happened. When Larry Brick was growing up, his younger sister translated for him when he called a girl for a date or to talk. Technology has improved to the point that he now travels with a laptop computer with a camera, said Brick, a deaf Philadelphia resident and consumer advocate on advisory councils. He can talk with someone through video-relay service on a wireless connection. Brick is concerned that Sorenson is a "vertically integrated" phone company, like the old AT&T. But, he wrote in an e-mail, "History shows that the progress of telecommunications had made it possible for me and thousands of others like me to become over time a part of the social fabric of communities."